Like some other parents, Iris Galicia, a mother of two who lives in West Athens, faces some challenges related to how to best raise her young children to ensure they grow up healthy and ready to attend school. That is why she and about 40 other people recently attended a “Family Fun Day” event at the Helen Keller Park community building. They came in hopes of strengthening their families by connecting with other parents and caregivers, along with community-based organizations and service providers that provide vital services to families, including St. Francis Medical Center (a Welcome Baby provider), South Los Angeles Health Projects and Early Childhood Linkages to Wellness. The event was organized by the Best Start West Athens Community Partnership, in collaboration with Reclaiming America’s Communities through Empowerment (RACE). Julio Reyes, a member of the West Athens Best Start Community Partnership and newly elected Leadership Group member, said the event brought much relief to parents. Reyes also works as an outreach specialist representing St. Francis Hospital through the Welcome Baby program that targets pregnant women. He explained that, for many families, connecting with other parents to share experiences, and finding out how to obtain vital services for their children, made a big difference in their lives. That is why this event last February succeeded in strengthening the bond between the residents and community-based organizations, so that they may see each other as united as they work together towards the same goal of strengthening families and communities, Reyes explained. Natasha Moise, a program officer for West Athens Best Start Community, echoed similar sentiments. 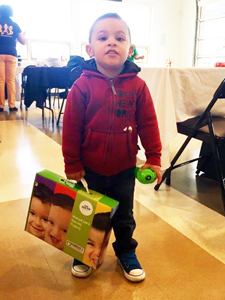 Myra Rivero, a resident outreach coordinator with the West Athens Best Start Community Partnership, said bringing residents, parents, and service organizations together is part of Best Start’s goal of creating healthier families and communities.